It integrates with a range of RPA tools from Blue Prism, UiPath, and others. It also can be leveraged by ISVs, System Integrators, BPOs, and IT technology strategists to incorporate ABBYY’s tools into their automation platforms. Enterprise customers and consulting partners participating in the Vantage early adopter program, include Merck (MSD), Symphony Ventures, RoboRana, and RPAbox. Common ‘content-centric’ pain points for RPA that Vantage is designed to address include: lengthy set-up and configuration, shortage of training data, shortage of skilled experts in areas like machine learning for automating unstructured content, and inability to scale across an enterprise organisation resulting in missed efficiency and cost gains. “For the first time, enterprises can automate content-based processes without requiring users to be tech experts. ABBYY has revolutionised the way organisations accelerate their digital transformation initiatives by simplifying technologies like AI and data capture. This makes content-centric processes easier to set up and configure with out-of-the-box core skills and advanced cognitive skills that make robots smarter,” stated Anthony Macciola, Chief Innovation Officer at ABBYY. The new platform minimises the complexity of processing content such as documents, forms, images, and email communications with a set of cognitive skills that allow digital workers to identify a document, find specific information, understand the content, and route the document or process the information on its content. Core cognitive skills include text recognition, classification, and data extraction coupled with learning and can be plugged into any type of document workflow. Advanced cognitive skills can be developed by partners and customers to perform specific tasks unique to a business operation, such as processing a loan application, insurance claim or bill of lading. The platform offers a simple pricing and licensing model based on document transaction volume making it easy for business users to quickly determine cost and ROI. Vantage is a componentised service platform with 100% HTML interfaces, therefore requiring no desktop installation. Vantage is available now for early adopters and will be generally available in Q2 2019 via www.abbyy.com/vantage. 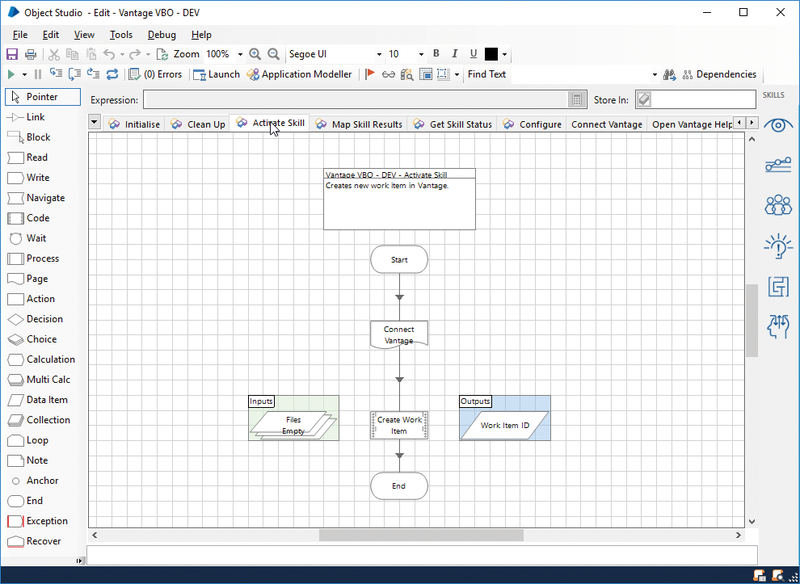 This screengrab shows ABBYY Vantage as it appears within Blue Prism's Object Studio, providing a developer or business analyst with a wizard-like tool to add cognitive skills when creating software robots to automate processes. Vantage also integrates with many other RPA platforms.